It finally feels like Spring is in the air – and hopefully for good! We did lose a few baby tomato plants, despite my midnight run through the garden covering plants with towels and all my clothing! I guess there is always that risk of late frost when deciding to plant out early. 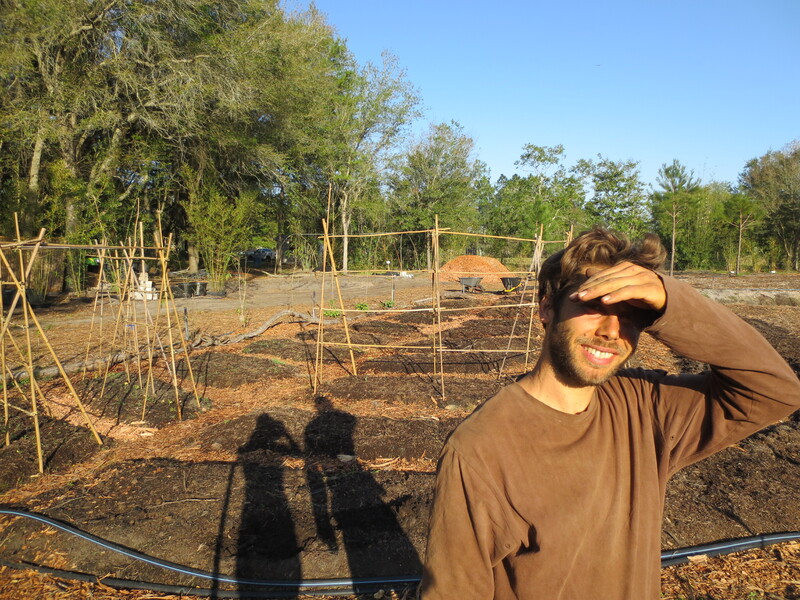 Things have been very busy since we began attending the Clermont farmers’ markets two weeks ago, and we have been checking projects off of our list with the help of our first two wwoofers, Liane and Anthony. They have been working hard and motivating us to get out there every day. 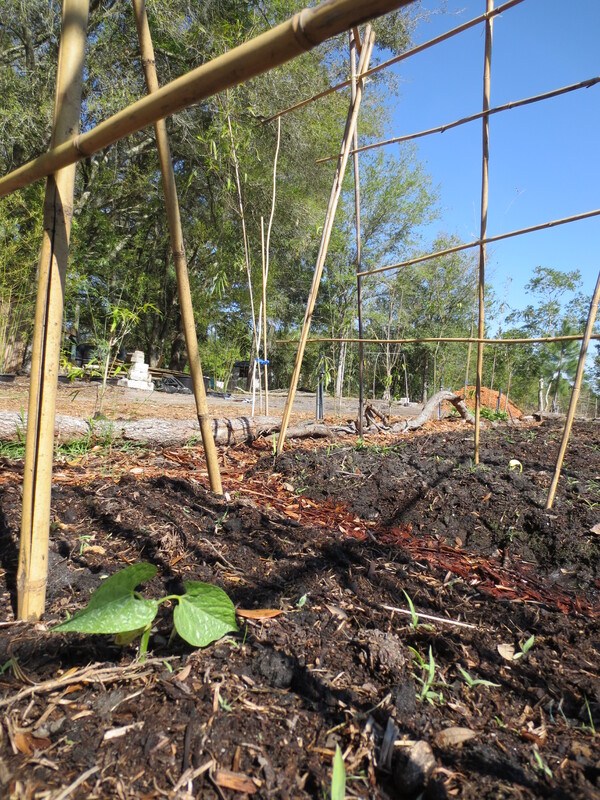 One of the most exciting projects has been building bamboo trellising for various climbing summer plants like beans, tomatoes and tomatillos. 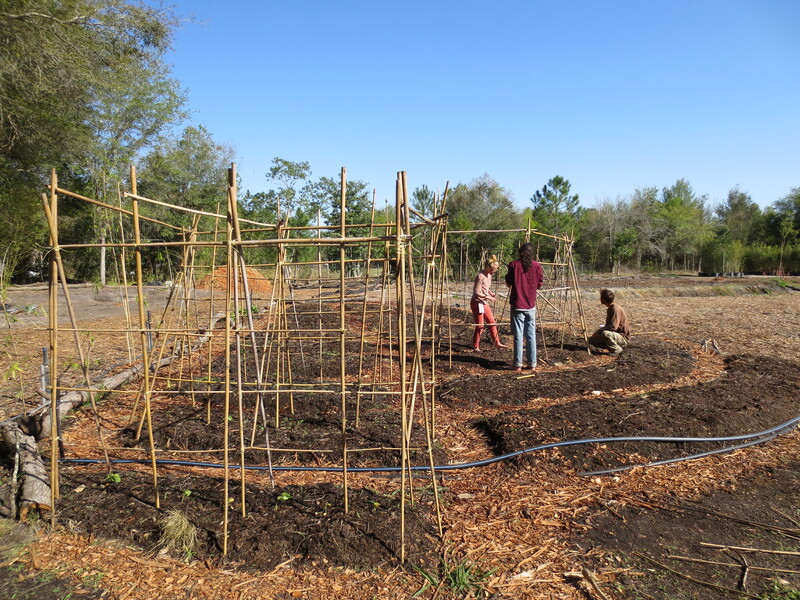 Tim (on right) with wwoofers Liane and Anthony building the bamboo trellising. You have room to grow up, baby Lima bean. Tim smiles after a hard day’s work. We’ve noticed a sure sign of Spring – pollinators! Tim and I dream of stewarding a hive of bees (hopefully soon), so seeing all of the wild bees and other winged creatures enjoying the flowers around the farm is truly heartwarming. 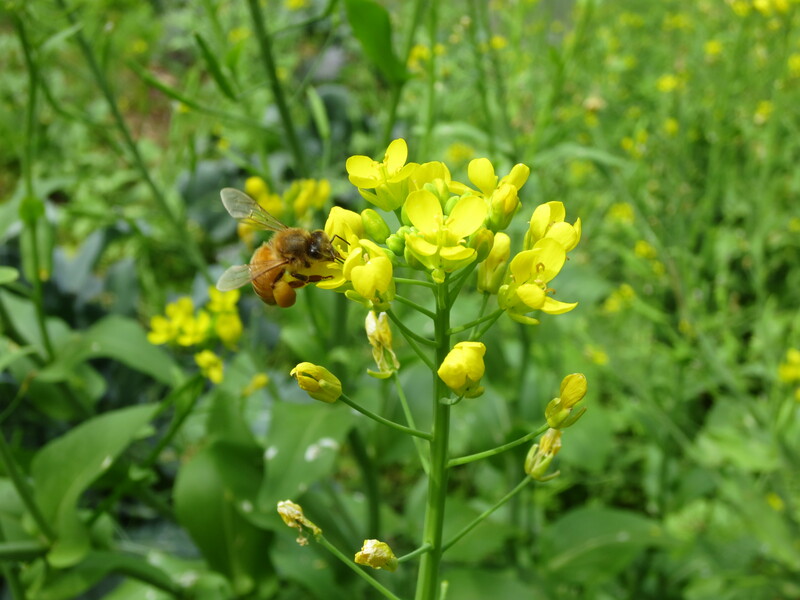 I’ve noticed they like the sunny yellow bok choy flowers especially well. Check out those pollen baskets! With the buzz in the air and temperatures rising, it wouldn’t be Spring without… fresh eggs! Yes, our hens have begun laying! Well, at least one has. We’ve been getting about one egg a day from our four hens. Since January, we’ve been (kind of) patiently awaiting their first egg. Tim found it the morning of our first Food Fermentation class, which delighted us! Hopefully the other hens will get the idea and begin laying as well. Thank you beautiful hens! It’s amazing how quickly we’ve fallen in love with these beautiful, interesting birds. We will be at the Clermont farmers’ market tomorrow for our third Sunday, and, as far as the weather goes, I’m hoping the third time’s the charm. (Unfortunately, I was terribly sick yesterday and missed out on a beautiful day at the market. Sorry to let down all you kale lovers out there. Still recovering today, but with luck, we’ll be back next week.) If the weather is anything like today, it’ll be a beautiful day to be out there supplying our community with mindfully grown, consciously cared-for, freshly picked, delightfully nutritious kale! Everything looks great! Our first two wwoofers of the season arrived yesterday. We have just reserved some bees and Zeke’s taking the class at the end of April…we’ll keep you posted on what’s buzzing here! 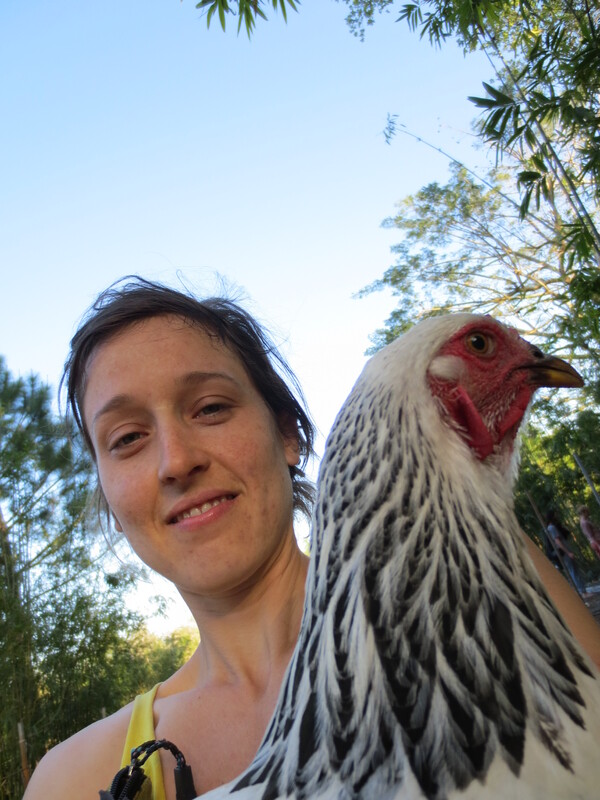 Also, thinking of getting some chickens too… 🙂 Keep it up, your garden and produce looks beautiful! I swear, it’s warm here one day and freezing the next! I hope your plants hang in there!